Editor’s Note: This guest post is written by Irina Tsumarava, a Marketing Coordinator at aheadWorks. Regardless of whether you are a merchant or a vendor, you can’t help but notice how people around you are addicted to mobile devices - they almost live in virtual reality. When mobile shopping is no more a challenge as storefronts are adapted to mobile screens at most, merchants, however, still suffer from not being able to control their websites on the go. Let’s say I operate the store on Magento. I am regularly out of the office to negotiate favorable supply conditions to keep my inventory full or have appointment with partners and at the same time I want to track store performance and be aware of my sales. If I try to access Magento backend from my mobile gadget, I will be totally pissed off with what I’ll see. It will require heaps of time to get anything useful like order and sales information from mobile admin. It was a pressing demand of the time: we were bombarded with requests from our customers to grant them access to store statistics via mobiles. Moreover, we needed the exact same functionality for our own store with Magento extensions and themes. That’s how OnPulse appeared. 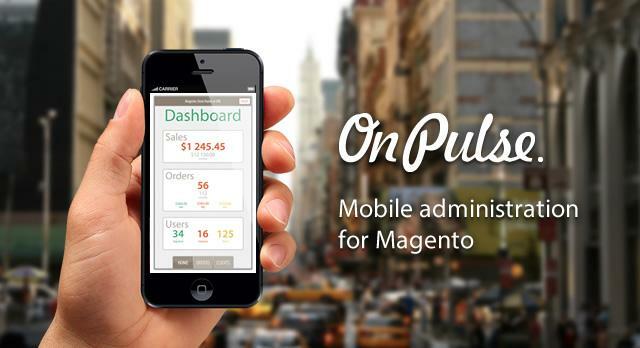 OnPulse is a web-based service allowing merchants to view their store sales statistics right from iOS/Android mobile device when they don’t have accesses to PC. At present, OnPulse lets store owners obtain information on last clients and orders, browse over order statuses and review order items. They can also email customers or give them a call directly from their devices. Later merchants will also be able to manage orders and inventory. It doesn’t make sense to develop native iOS/Android apps to access Magento store statistics. It obviously prolongs update releases and apps can’t react on merchant’s needs instantly. Even though some merchants are asking for fully functional Magento mobile backend, it’s hardly a demand. It will be extremely difficult to add products to catalogs using smartphones only, let alone create mobile admin panel of such a complex platform as Magento for 3.5-4-inch displays. In two weeks after the service launch OnPulse connector extension was downloaded by over 3,000 merchants with no significant advertising efforts from our side. We perceive it as indicator of merchant’s interest to control stores with the help of gadgets. Feel free to try OnPulse and leave your comments with ideas - what, in your opinion, should be fixed or added.